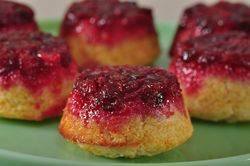 Cranberry Upside Down Muffins have a glistening red cranberry sauce sitting on top of a soft and fluffy white cake. Although made in individual-sized servings, these pretty muffins follow the basic concept of all upside down cakes, that is, fruit on the bottom and cake on top. Gail Sher wrote a terrific book 'From a Baker's Kitchen' in 1984. It is one of those books that you want to have in your cookbook collection as it bridges the gap between the professional and the home baker. It is full of information about ingredients, techniques, good recipes, and lovely line drawings. One recipe that I love is for these Cranberry Upside Down Muffins. It starts with cooking fresh cranberries with sugar until the cranberries have broken down and you end up with a thick and syrupy sauce that won't seep too much into the cake batter during baking. Once made the sauce is evenly divided among the muffin tins (make sure your muffin cups are well greased) and the next step is to make the muffin batter. The batter follows the simple muffin batter principle of using just two bowls. One bowl for the dry ingredients and one bowl for the wet ingredients. The wet and dry ingredients are simply stirred together and then the batter is evenly placed on top of the cranberry sauce. Once the muffins are baked, they are inverted, so you have the cranberry sauce on top with a lovely moist cake-like batter underneath. These muffins are lovely warm from the oven and make a great brunch dish, especially during the holiday season when fresh cranberries are in season. I find it's always a good idea to buy a couple of extra bags of fresh cranberries and place them in the freezer. That way you can make cranberry desserts all year round. Cranberry Upside Down Muffins: Preheat your oven to 400 degrees F (200 degrees C). Place the oven rack in the middle of the oven. Butter or spray 12 muffin cups with a non stick vegetable spray. Cranberry Sauce: In a small saucepan place the cranberries, sugar, and water. Cook over medium heat, stirring frequently, until the sugar dissolves and the cranberries start to pop open, about 10 minutes. Remove from heat and set aside to cool slightly while you make the batter. Muffin Batter: In a large mixing bowl, whisk the flour with the sugar, baking powder, salt, and nutmeg (if using). In a separate bowl, whisk the beaten egg with the milk, vanilla extract, and melted and cooled butter. Add the milk and egg mixture to the flour mixture. Stir just until combined. Do not over mix the batter or the muffins will be tough when baked. Evenly divide the cranberry mixture (about 1 tablespoon (25 grams)) among the 12 well greased muffins cups and then evenly spoon the batter over the cranberry sauce. Place in the oven and bake for about 14 - 18 minutes, or until a toothpick inserted in the center just comes out clean. Place on a wire rack to cool for about a minute, and then invert the pan, and remove the muffins. Let them finish cooling with the cranberry topping facing up.